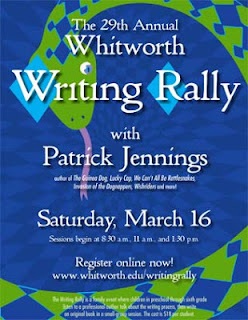 The Whitworth Writing Rally, a family literacy initiative for students in pre-school through sixth grade, will celebrate its 29th year by welcoming to campus author Patrick Jennings. This year’s rally will take place Saturday, March 16, with sessions beginning at 8:30 a.m., 11 a.m. and 1:30 p.m. in Weyerhaeuser Hall. Registration for this event is available online at www.whitworth.edu/writingrally. The registration fee is $18, which pays for a T-shirt, snacks, writing and art supplies and participation for one child and a parent or adult guardian. The deadline for registration is Wednesday, March 6. This year’s event features Patrick Jennings, a teacher, librarian and author, and provides the opportunity for participants to work and create their own books with teachers or with Whitworth education students. As many as 350 students from the Inland Northwest are expected to participate. Patrick Jennings published his first children’s book, Faith and the Electric Dogs, in 1998. Since that time, he has gone on to write 18 children’s books, with more to come. Faith and the Electric Dogs was a Booklist Editor’s Choice; it was also selected by the Texas Bluebonnet Master List and was featured in three starred reviews. His next book, My Homework Ate My Homework, is scheduled for release April 23. Each session will begin with a presentation from Jennings about the writing process. Then the students will move on to a teacher-guided writing session in which the participants write their own books. The students will share their writing with their group. To end the session, a cookie reception will be held in the Hixson Union Building. Parents are invited to stay with their children throughout the session. Picanco says scholarships will be available for some students, based on both nominations by school principals and financial need. The Whitworth Writing Rally is sponsored by Pemco, Red Lion Hotels, Spokane Rotary Club 21, Kiwanis and Spilker Masonry. Located in Spokane, Wash., Whitworth is a private liberal arts university affiliated with the Presbyterian Church (USA). The university, which has an enrollment of 3,000 students, offers 60 undergraduate and graduate degree programs.